Whitewashed Cast Iron Ship Wheel Key Chain 5"
Antique White Cast Iron Propeller Key Chain 5"
Light Blue Whitewashed Cast Iron Propeller Key Chain 5"
Red Whitewashed Cast Iron Propeller Key Chain 5"
Antique White Cast Iron Anchor Key Chain 5"
Antique Silver Cast Iron Sailboat Key Chain 5"
Antique Bronze Cast Iron Sailboat Key Chain 5"
Dark Blue Whitewashed Cast Iron Sailboat Key Chain 5"
Antique Silver Cast Iron Diver Helmet Key Chain 5"
Antique Gold Cast Iron Propeller Key Chain 5"
Antique Gold Cast Iron Sailboat Key Chain 5"
Antique Silver Cast Iron Propeller Key Chain 5"
Whitewashed Cast Iron Propeller Key Chain 5"
Antique Bronze Cast Iron Ship Wheel Key Chain 5"
Antique Silver Cast Iron Ship Wheel Key Chain 5"
Dark Blue Whitewashed Cast Iron Ship Wheel Key Chain 5"
Light Blue Whitewashed Cast Iron Ship Wheel Key Chain 5"
Red Whitewashed Cast Iron Ship Wheel Key Chain 5"
Dark Blue Whitewashed Cast Iron Propeller Key Chain 5"
Light Blue Whitewashed Cast Iron Sailboat Key Chain 5"
Antique Bronze Cast Iron Diver Helmet Key Chain 5"
Rustic Black Cast Iron Diver Helmet Key Chain 5"
Antique Bronze Cast Iron Propeller Key Chain 5"
Antique White Cast Iron Ship Wheel Key Chain 5"
Antique Gold Cast Iron Ship Wheel Key Chain 5"
Dark Blue Lifering Bottle Opener 3"
Red Lifering Bottle Opener 3"
Antique Silver Cast Iron Anchor Key Chain 5"
Solid Brass Close Band Rope Key Chain 5"
Chrome Knot Key Chain 5"
Antique Brass Close Band Rope Key Chain 5"
Solid Brass Sheet Band Knot Key Chain 5"
Solid Brass Clove Hitch Knot Key Chain 5"
Brass Knot Key Chain 5"
Antique Copper Knot Key Chain 5"
Solid Brass Shackle Key Chain 4"
Rustic Light Blue Whitewashed Deluxe Cast Iron Anchor Bottle Opener 6"
Rustic Red Whitewashed Deluxe Cast Iron Anchor Bottle Opener 6"
Rustic Silver Cast Iron Wall Mounted Seahorse Bottle Opener 6"
Solid Brass Tarbuck Knot Key Chain 5"
Whitewashed Cast Iron Anchor Key Chain 5"
Light Blue Whitewashed Cast Iron Anchor Key Chain 5"
Dark Blue Whitewashed Cast Iron Anchor Key Chain 5"
Red Whitewashed Cast Iron Anchor Key Chain 5"
Whitewashed Cast Iron Sailboat Key Chain 5"
Rustic Whitewashed Cast Iron Diver Helmet Key Chain 5"
Rustic Whitewashed Cast Iron Sailboat Hook 6"
Wouldn't it be embarrassing if you're sitting in your well appointed nautical recreation room and, when one of your guests needs a bottle opener, you furnish him one that doesn't compliment your existing theme? 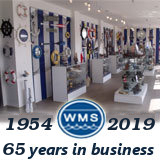 As you would expect, Handcrafted Nautical Decor has a wide range of nautical accents from which to choose: nautical bottle openers, life rings, brass diving helmets, nautical clocks and paperweights to name but a few. All are wonderful ways to express your love of the sea and act as a relaxing touchstone in a hectic office environment.